>>> Una pagina degna della bellissima poesia di Vrettakos! Questa pagina è dovuta a una intuizione di Alessandro, che la ha espressa sulla pagina, da lui curata, su una canzone di Michel Fugain, Les Très-hauts. In tale canzone si nomina il paese di Oradour-sur-Glane, teatro di un'orrenda strage nazista; Alessandro si è quindi chiesto se esistesse qualche canzone sulla “Marzabotto greca”, il villaggio di Distomo in Beozia (presso Delfi), dove il 10 giugno 1944 fu compiuta dai nazifascisti un'analoga strage che provocò 218 vittime tra la popolazione inerme. A tale riguardo, lo stesso Alessandro (ora noto come “Bartleby”) ha reperito le tracce di una poesia di uno dei maggiori poeti greci contemporanei, Nikiforos Vrettakos, che è stata messa in musica e interpretata in un recente album dovuto, significativamente, alla diaspora ellenica all'estero. La poesia di Vrettakos sulla strage di Distomo (che significa “doppio taglio”), intitolata Επιμνεμόσυνη γονυκλυσία (“Genuflessione in memoria”), è stata messa in musica e interpretata da due greci della diaspora, e si tratta di una diaspora lontanissima. In Australia, per la precisione. Il musicista, Arthur Rorris, in greco è Θανάσης Ρόρρης; assieme alla cantante, Anthea Sidiropoulos (Ανθέα Σιδηροπούλου) mostra una grecità ancora ben presente e legami fortissimi con la madrepatria, tanto da essersi dedicato, come molti musicisti greci, all'armonizzazione di grande poesia moderna. 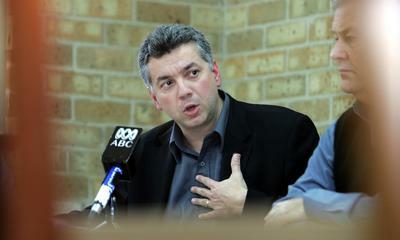 Dalla Grecia di Theodorakis, Xarchakos e Markopoulos all'Australia di Rorris il passo sembra essere brevissimo. 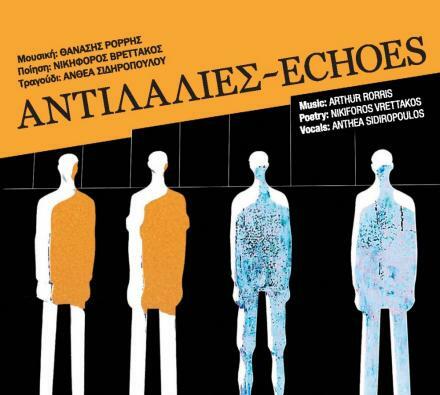 L'album che i due hanno realizzato assieme, intitolato Αντιλαλίες / Echoes, è interamente dedicato alla poesia di Vrettakos. Così viene introdotto da Arthur Rorris: “The CD Echoes is a cycle of seven songs that I have composed based on the work of the famous Greek Poet and Nobel finalist Nikiforos Vrettakos. 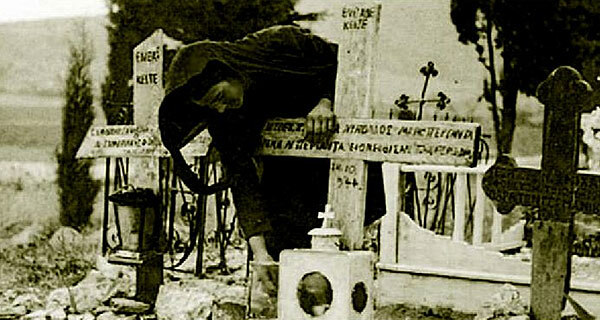 The somber strains of the first track Distomo, reflect on one of the worst war time atrocities in Central Greece near the historic site of Delphi, where the German SS summarily executed more than 200 men, women and children as it was retreating in 1944. Another piece, The Earth’s Poem, is a cry for the environment ahead of its time and A Smaller World reflects the poet’s deep commitment to peace and disarmament, East and West. 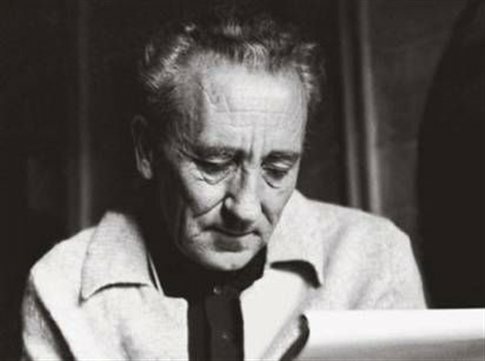 This year, 2012 marks 100 years since Vrettakos’ birth and is being marked by festivals and other events in his honour, both in Greece and abroad, including in Australia. This work, is dedicated to the memory of his life and work and to the people of Distomo and elsewhere in the world where the struggle for peace, justice and humanity continues today just as fervently as it did in the 1930s and 40s, hence the title, Echoes. 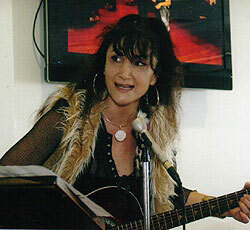 This work would not have been possible without the extraordinary generosity and contributions of a number of people and in particular the outstanding vocalist Anthea Sidiropoulos, who committed to and supported this project from the very beginning, Kostas Vrettakos who allowed this project to get off the ground with permission to use his father’s poetry, Angelika Korovessi who generously allowed the alteration and use of her work, National Resistance Monument, Greece 1997 on the cover, cellist Kaija Upenieks, guitarist Ann Lehmann, mastering engineer Ed Lee, Gaye Burrows, Nick Canosa, and of course my wife Louise and extended family whose encouragement and support knows no boundaries. Come già reperito da Alessandro/Bartleby (cui, idealmente, va il merito di questa pagina che permette di aggiungere alla memoria il crimine nazista di Distomo), dal sito della cantante Anthea Sidiropoulou è possibile scaricare questo documento .PDF in cui si parla meglio dell'album e che contiene anche a traduzione inglese della poesia di Vrettakos. Στο Δίστομο του νομού Βοιωτίας έγινε κατά τον Β' Παγκόσμιο πόλεμο μια εκ των μεγαλύτερων σφαγών αμάχων από τις στην Ελλάδα Γερμανικές κατοχικές δυνάμεις. Στις 10 Ιουνίου του 1944 ο Fritz Laufenbach, λοχαγός των SS του 2ου λόχου του 1ου τάγματος του 7ου τεθωρακισμένου συντάγματος της αστυνομίας SS, έλαβε διαταγή να μετακινήσει τον λόχο του από την Λειβαδιά προς το Δίστομο, Στείρι και Κυριάκι με σκοπό τον εντοπισμό ανταρτών στην δυτική πλευρά του Ελικώνα. Σαν δόλωμα οι Γερμανοί είχαν 2 επιταγμένα Ελληνικά φορτηγά γεμάτα με άνδρες των SS μεταμφιεσμένους σε χωρικούς, που προπορεύονταν της κύριας φάλαγγας. Ταυτόχρονα ο 10ος και 11ος λόχος του 3ου τάγματος από την Άμφισσα κατευθυνόταν προς το Δίστομο για να συναντήσουν τον 2ο λόχο. Οι 3 λόχοι συναντήθηκαν χωρίς να έχουν εντοπίσει αντάρτες εκτός από 18 παιδιά που κρύβονταν σε γύρω στάνες. Έξι από τα παιδιά που προσπάθησαν να δραπετεύσουν εκτελέστηκαν. Οι Γερμανοί μπήκαν στο Δίστομο και εκφοβίζοντας τους χωρικούς έμαθαν ότι υπήρχαν αντάρτες στο Στείρι. Ο 2ος λόχος κατευθύνθηκε προς τα εκεί και στην θέση Λιθαράκι ,περιοχή του Στειρίου έπεσε σε ενέδρα των ανταρτών του 11ου λόχου του 3ου τάγματος του 34ου συντάγματος του ΕΛΑΣ. Η μάχη του Στειρίου ήταν σκληρή και κράτησε περίπου μέχρι τις δύο το μεσημέρι αναγκάζοντας τους Γερμανούς σε οπισθοχώρηση. Οι απώλειες των Γερμανών ήταν περίπου 40 νεκροί και των ανταρτών 1. Οι αντάρτες φτάνοντας στο Στείρι επέλεξαν το κατάλληλο σημείο στήνοντας ενέδρα με τρεις διμοιρίες στη θέση Λιθαράκι 1,5 χιλιόμετρο πριν το χωριό περιμένοντας τους Γερμανούς. Οι Γερμανοί φθάνοντας στο Δίστομο και τρομοκρατώντας τους κατοίκους απόσπασαν την πληροφορία ότι υπάρχουν αντάρτες στο Στείρι. Έτσι πριν τις 12:00 το μεσημέρι, 4 γερμανικά και 2 επιταγμένα ελληνικά φορτηγά γεμάτα με άνδρες των SS μεταμφιεσμένους σε χωρικούς για να μην κινήσουν υποψίες , έφυγαν από το Δίστομο με προορισμό το Στείρι με σκοπό να συνεχίσουν και εκεί τα ίδια (βιαιοπραγίες, εκφοβισμό και εκτελέσεις του πληθυσμού).Η μάχη κράτησε περίπου μέχρι τις δύο το μεσημέρι αναγκάζοντας τους Γερμανούς σε οπισθοχώρηση . Οι απώλειες των Γερμανών ήταν περίπου 40 νεκροί άνδρες, μεταξύ αυτών και ένας αξιωματικός που εκτελούσε χρέη μεταφραστή, ο οποίος μεταφέρθηκε τραυματισμένος και πέθανε στο Δίστομο ενώ των Ελλήνων 15 νεκροί. Έτσι τελείωσε η μάχη αυτή με οδυνηρές απώλειες για τους Γερμανούς αλλά και για τον άμαχο και αθώο πληθυσμό του γειτονικού χωριού. On June 10, 1944, for over two hours, Waffen-SS troops of the 4th SS Polizei Panzergrenadier Division under the command of SS-Hauptsturmführer Fritz Lautenbach went door to door and massacred Greek civilians, reportedly in revenge for a partisan attack. A total of 218 men, women and children were killed in Distomo, a small village near Delphi. According to survivors, SS forces "bayoneted babies in their cribs, stabbed pregnant women, and beheaded the village priest." The battle report states that 'members and suspects of gangs' were killed in the course of a 'retaliation measure' against partisan resistance. However, survivors of the massacre reported afterwards that men as well as children were shot, women were violated and killed. No soldier was ever held responsible for the massacre. In the meantime Italian courts have likewise awarded compensation to Italian victims of the German occupation. The Greek victims were successful in their claim for enforceability of their legal titles against German property in Italy awarded by Greek courts. Germany has objected to this by saying that these were 'sovereign measures' and has claimed 'state immunity' for the war crimes and the crimes against international law. Both the Areopag as well as the Italian court of appeal have rejected this argument. In December 2008 the German government has filed a lawsuit at the International Court of Justice in Den Haag in order to circumvent the enforcement of the compensation claims. Its aim is to establish once and for all that this kind of lawsuits does not fall under the competence of the Italian courts, that their rulings constitute an infringement of international law and that they constitute an infringement of Germany' sovereignty rights. Following the massacre, a Secret Field Police agent accompanying the German forces informed the authorities that, contrary to Lautenbach's official report, the German troops had come under attack several miles from Distomo and had not been fired upon "with mortars, machine-guns and rifles from the direction of Distomo". An inquiry was convened. Lautenbach admitted that he had gone beyond standing orders, but the tribunal found in his favour, holding that he had been motivated, not by negligence or ignorance, but by a sense of responsibility towards his men. 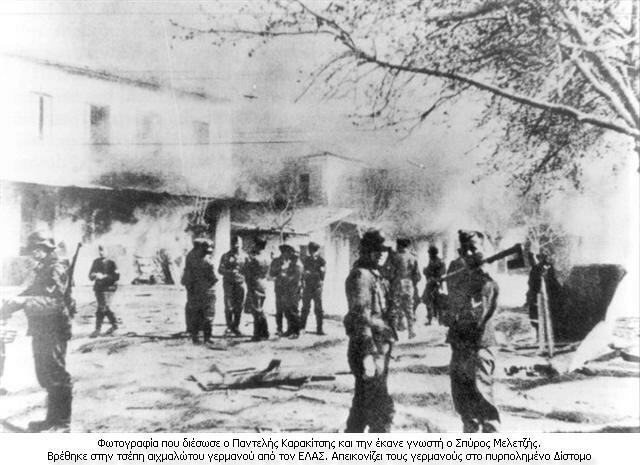 As the matter of reparations and restitution between Greece and Germany is not closed, survivors and relatives of the victims made claims for individual compensation and sued in the German courts and the European Court of Human Rights, which could have made Germany liable for several billion dollars in reparations. The claims were denied by the European Court of Human Rights and by German lower courts and in June 2003 were rejected by the Federal Court of Justice. Federal Constitutional Court of Germany ruled in March 2006, it didn’t have to pay compensation to individuals seeking damages over war crimes. In November 2008, a court in Florence ruled that the families of the 218 men and women killed should be awarded a villa in Menaggio, near Lake Como, which is owned by a German state nonprofit organization, by way of restitution. Germany appealed against the Italian ruling at the International Court of Justice, claiming for State immunity. In January 2011, Prime Minister of Greece George Papandreou announced that the Greek Government will be represented at the International Court of Justice in relation to the claim for reparations by relatives of victims. A Distomo, nel nomos di Beozia, avvenne durante la II guerra mondiale una delle maggiori stragi di persone inermi da parte delle truppe di occupazione tedesche in Grecia. Il 10 giugno 1944, Fritz Laufenbach, capitano della I Compagnia, I Battaglione, VII Divisione Corazzata delle SS, ricevette l'ordine di spostare il suo reparto da Livadià a Distomo, Stiri e Kyriaki, allo scopo di localizzare i partigiani operanti sul versante occidentale dell'Elicona. Come esca, i tedeschi utilizzarono due camion greci requisiti, pieni di uomini delle SS travestiti da contadini, che precedevano il grosso della truppa. Allo stesso tempo, la X e la XI Compagnia del III Battaglione furono fatte dirigere da Amfissa a Distomo per ricongiungersi con la II Compagnia. Le tre compagnie si ricongiunsero senza aver individuato alcun partigiano, a parte diciotto ragazzi che si nascondevano negli ovili della contrada. Sei dei ragazzi, che avevano tentato di disertare, furono fucilati. I tedeschi entrarono a Distomo e, terrorizzando gli abitanti del paese, vennero a sapere che c'erano dei partigiani a Stiri. La II Compagnia vi fu fatta dirigere e, in località Litharaki, nei pressi di Stiri, cadde in un'imboscata dei partigiani della XI Compagnia del III Battaglione della 34a Brigata dell'ELAS. La battaglia di Steiri fu durissima e durò all'incirca fino alle 2 del pomeriggio, costrigendo i tedeschi a ritirarsi. I tedeschi persero quaranta uomini, i partigiani quindici. La mattina di sabato 10 giugno 1944, alle forze della XI Compagnia della Brigata III/34 dell'ELAS, guidate dal capitano Christoforos fu ordinato di spostarsi da Kyriaki a Stiri per attendere le restanti truppe tedesche cui era stato ordinato di spostarsi da Livadià e da Amfissa per terrorizzare la popolazione non soltanto di Distomo, ma anche di Stiri e di Kyriaki. In quel periodo, molti abitanti di quei paesi erano organizzati nell'EAM e aiutavano l'ELAS nella lotta di liberazione mentre il III Reich pativa parecchie sconfitte non soltanto in Grecia, ma in tutta Europa. Quando arrivarono a Stiri, i partigiani convennero un segnale e tesero un agguato con tre loro plotoni, nella località detta Litharaki, a 1 km e mezzo dal paese che stava attendendo i tedeschi. Arrivati a Distomo, terrorizzando la popolazione i tedeschi riuscirono a strappare l'informazione della presenza di partigiani a Stiri; in tale modo, prima di mezzogiorno, i 4 camion tedeschi e i 2 camion greci requisiti pieni di soldati SS travestiti da contadini per non destare sospetti, partirono da Distomo in direzione di Stiri, per continuare con le azioni terroristiche e con lo sterminio della popolazione. Come detto, la battaglia andò avanti fino a circa le 2, e i tedeschi furono costretti a ritirarsi. Le perdite tra i tedeschi ammontarono a 40 uomini, tra le quali un ufficiale che svolgeva compiti di interprete il quale fu trasportato a Distomo e vi morì. Tra i greci si ebbero 15 caduti. Terminò così la battaglia, con pesanti perdite per i tedeschi, ma anche con la strage della popolazione inerme e innocente del vicino paese. Dopo la battaglia, i tedeschi rientrarono a Distomo e, come rappresaglia per le perdite che avevano subito, iniziarono a sterminare tutti coloro che avevano trovato nel paese. Folli di rabbia per l'umiliante sconfitta patita dai partigiani greci, non risparmiarono dal macello neppure le donne, i bambini e i vecchi. Il parroco del paese fu decapitato, furono uccisi dei neonati e le donne furono stuprate prima di essere uccise. La strage si fermò soltanto sul far della sera (il che avviene tardi in giugno), quando le truppe dovettero rientrare a Livadià; prima, però, diedero fuoco alle case del paese. Sulla strada del ritorno continuarono a uccidere tutti coloro in cui si imbattevano. A Distomo si ebbero 228 vittime, tra le quali 117 donne e 111 uomini; tra tutti, 53 ragazzi e bambini al di sotto dei 16 anni. Secondo la testimonianza dell'inviato della Croce Rossa Internazionale, lo svizzero George Wehrly, che giunse a Distomo pochi giorni dopo la strage, nell'intera zona si ebbero però circa 600 morti. Uno degli ufficiali ritenuti responsabili della strage di Distomo, Hans Zampel, dopo la fine della guerra fu arrestato in Francia e fu decisa la sua estradizione in Grecia; ma fu richiesto anche il suo trasferimento in Germania per le indagini che là lo riguardavano, e naturalmente vi rimase vivendo il resto della sua vita in libertà. Il capitano delle SS Fritz Laufenbach, dopo aver dato l'ordine della strage, aveva redatto un falso rapporto che fu riconosciuto tale persino da un dirigente della Gestapo, Georg Koch. Μάρτυς ο ήλιος μας δεν σας ξεχάσαμε ! για τους ήρωες, τους μάρτυρες τους αγίους της. οι μορφές σας, στέκουν πάνω απ’ την ποίηση. Distomo (Beozia). Una donna china sulle tombe di alcune vittime della strage. Il nostro cuore è un vasto terreno di resurrezione. pieni di sangue, di fori, di terra. Testimone il nostro sole: non vi abbiamo dimenticati! per i suoi eroi, i suoi martiri, i suoi santi. quando, là, perdeste le vostre case, i vostri figli. le vostre forme s'innalzano sopra la poesia. gli si addirebbe, un abito per il vostro sacrificio. 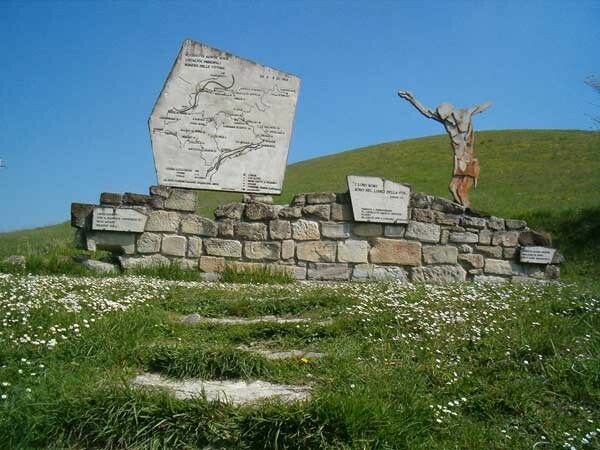 L'Epigrafe per i Caduti di Marzabotto fu scoperta il 3 ottobre 1954 alla base del "Faro del Martirio", costruito su un promontorio presso Marzabotto. Marzabotto: Il "Faro del Martirio" con l'epigrafe di Salvatore Quasimodo. Μαρτσαμπότο: Ο "Φάρος του Μαρτυρίου" με την επιγραφή του Σαλβατόρε Κουαζίμοντο. Η Επιγραγή για τα Θύματα του Μαρτσαμπότο εγκαινιάστηκε στις 3. Οκτωβρίου 1954 στη βάση του “Φάρου του Μαρτυρίου”, σε ένα ακροτήριο κοντά στο Μαρτσαμπότο. ως αντίποινα γι' ενέργειες ανταρτικού πολέμου. με το όνομα του Μαρτσαμπότο. Direi che la pagina ha preso forma, anche se ancora non è completa. Per Gian Piero: mi avevi chiesto privatamente notizie su questa cosa, e credo di averle spiegate anell'introduzione. Ovviamente tutta la nostra gratitudine va ad Alessandro/Bartleby che ha scoperto questo autentico tesoro di poesia e di memoria; si è guadagnato un corso gratuito di greco di cui potrà usufruire quando vorrà, a cura diretta del sottoscritto. Dal nulla, si può dire, guarda quante cose avete già fatto emergere: addirittura la copertina del disco! Distomo: ci passai, credo, durante il mio primo viaggio in Grecia, capitandoci senza saperlo dopo avere visitato il monastero di Osios Loukas. Compitai a fatica - allora il mio greco era debole - un enorme tabellone di latta incrostata di ruggine, e capii, più o meno, che cosa vi fosse successo. E' lungo l'elenco delle stragi di civili greci, perpetrate durante l'occupazione. Kalavrita, Kommeno di Arta, Kandanos, Kessarianì; e poi quelle dei Bulgari in Tracia, altrettanto orrende; e non mancano quelle commesse dagli italiani come quella di Mikrò Horio. La poesia di Vrettakos è davvero molto bella e la tua traduzione è più che degna: perché metterci mano anch'io? Il link biografico al sito di Anthea Sidiropoulou a me non funziona: è così per tutti? Una pagina degna della bellissima poesia di Vrettakos! Grazie Ελληνικό Τμήμα των ΑΠΤ e grazie Riccardo per la traduzione e per il corso di greco che mi offri. Come raccontai a GPT ormai molto tempo fa è una lingua che ho odiato mortalmente (ho fatto il Classico!) e che non ho mai imparato; forse avrei proprio bisogno di riconciliarmi, chissà, si vedrà, comunque grazie! La pagina, come dicevo, non è ancora terminata; manca ancora la storia della terribile strage di Distomo in italiano, cosa che sto preparando. Intanto, però, aggiungo alla pagina, a mo' di completamento e di fratellanza nel dolore e nella memoria, ciò che un altro grande poeta, Salvatore Quasimodo, scrisse a proposito di Marzabotto. Sostengo che, probabilmente, pochi in Grecia conoscono le stragi naziste avvenute in Italia; per i Greci, forse, "italiano" significa casomai autore di stragi, come quella di Mikro Horio. Così anche noi, in Italia, pochissimo sappiamo delle stragi avvenute in Grecia e altrove. Questa è una barbarie che ha insanguinato l'Europa intera, e sentire ancora adesso parlare di nazifascismo dovrebbe farci semplicemente rivoltare; di questo qui si parla, non d'altro. Così, come ho tradotto in italiano la poesia di Vrettakos, ho tradotto in greco l'epigrafe di Quasimodo. Ora che la pagina è finalmente terminata (con l'introduzione anche in lingua italiana sulla storia della strage di Distomo), si può dire che Distomo era già stata nominata da tempo nel "mare magnum" di questo sito, senza però approfondire un po' la questione: esattamente in Federico Garcia Lorca, la poesia di Nikos Kavvadias musicata da Thanos Mikroutsikos. Un'occasione per rileggere questa e altre poesie di Kavvadias tradotte da Gian Piero Testa, che tra le altre cose è senza dubbio il principale "kavvadiologo" italiano. Il "mare magnum" del sito nascondeva già anche Anthea Sidiropoulos, e da tempi antichi; addirittura, a suo tempo aveva persino scritto alle CCG/AWS per la sua canzone in inglese già inserita. Abbiamo naturalmente rimediato anche a questa dimenticanza. Thank you for your posting of this work. My name is Arthur Rorris and I am the composer of the song "Distomo" which is the first track of the new CD "Echoes Antilalies". It is an honour to have this work included in your collection and I was wondering if you would an mp3 version of this track so that your readers may be able to listen to it as well? If so please let me know where you want the audio file to be sent. Or it might be easier if I upload to youtube and send you the link. In the meantime here is another track from this CD, "Dixos Ese - Without you"
Dear Mr Rorris, we are honoured to have you as guest in our website and in this special page devoted to your work; please extend our thankful greetings to Mrs Sidiropoulos too. Of course we would be happy to get an mp3 version of this track; you may choose between sending the track directly to our email address, antiwarsongs@gmail.com, or uploading it to YouTube, or perhaps both. Please allow us to thank you for setting such a great poem by Nikiforos Vrettakos to music. I have uploaded a video slide show and the audio track for "Distomo" to my youtube channel which can be viewed from here. Dear Mr Rorris, as you can see the video slide show and the audio track for "Distomo" have been included in this page. We thank you heartily for allowing our readers to listen to your song about one of the most terrible atrocities ever committed in Greece.